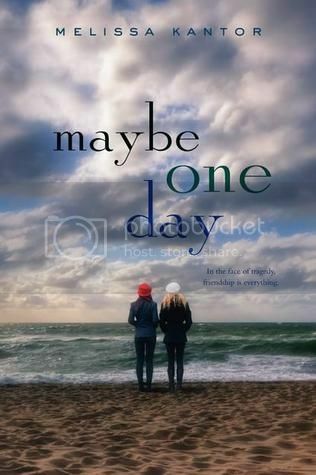 I was a little torn when I first decided to read Maybe One Day. The story sounded interesting, but I knew the book was going to be sad, and I make it a point not to read sad books very often. I put the book off a few times, afraid to start it, but I’m so glad that I finally decided to read it. This book was an excellent story of friendship and loss, and how quickly life can change in an instant. Zoe and Olivia had always been friends. The friendship that these girls have is not one that happens for just anyone, and you can tell throughout the book that there it is more than just an average friendship. These girls are more like sisters, and they care for each other so very much. Through the book we get to see the girls tackle all the challenges that come with cancer, and I admire Zoe for standing by her best friend through it all. I really felt like I was going through everything right along with them. The characters are definitely not perfect, but they were perfect for each other, and they were there for each other, and I guess that’s all that really matters in friendships. I read this book a lot faster than I expected to. I figured that with the sad storyline, that it would be something I would have to muddle through. But that wasn’t the case at all. Even though most of the story was everyday life of living with cancer, the story was still interesting, and I flew through the pages. While not everything in the book was realistic, it didn’t really take away from the story for me. There were some parts in the book that made me super ugly cry; I just couldn’t help it. I couldn’t imagine what these girls and their families were going through, and I hope I never have to. Overall; I really enjoyed reading this book, so much more than I expected to. You’ll definitely need some tissues available when you read it, because you definitely will feel the need to cry at some points. I’m definitely looking forward to reading more by this author! Aw, I don't like to cry!! But I've had some students asking for more books like TFiOS so this sounds like one I can recommend to them. I agree with you that the book had its flaws, but it was a really great story of friendship. And about the tissues. I definitely shed some tears! Great review!